A high speed winding machine with compact and durable construction. ACE coil widers for SMPS transformers, RF/IF coils, solenoid coils, relay coils, multi-section coils, trigger coils, telecom transformers etc. The latest technology burn off ovens for electric motors, plastic dies, automotive and more industrial applications. See our burn off oven brochure PDF with full features and specifications. 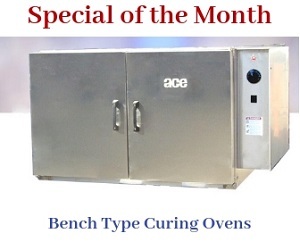 ACE curing ovens are known to be one of the most efficient production ovens in the world. Curing elevates the part temperatures to achieve the desired coating performance. ACE designed drying ovens for maximum efficiency and durability. For installation process and other features view our drying Oven brochure PDF with specifications. ACE industrial ovens are designed to offer maximum ease of use and maintenance. See our industrial ovens brochure PDF with full features and specifications.